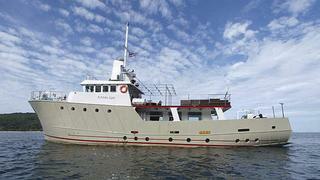 Eric Trupheme at Ocean Independence tells me of a €300,000 price drop on the 26.5m expedition yacht Kama Bay. Built by R. Lowestoft in 1978 and completely refitted in 2011, she now offers a new layout with high quality accommodation for 12 guests in six staterooms. A single 750hp diesel engine gives her an exceptional range of 12,000 nautical miles. Lying in Phuket, Thailand, Kama Bay is down from €3.5 million to €3.2 million.